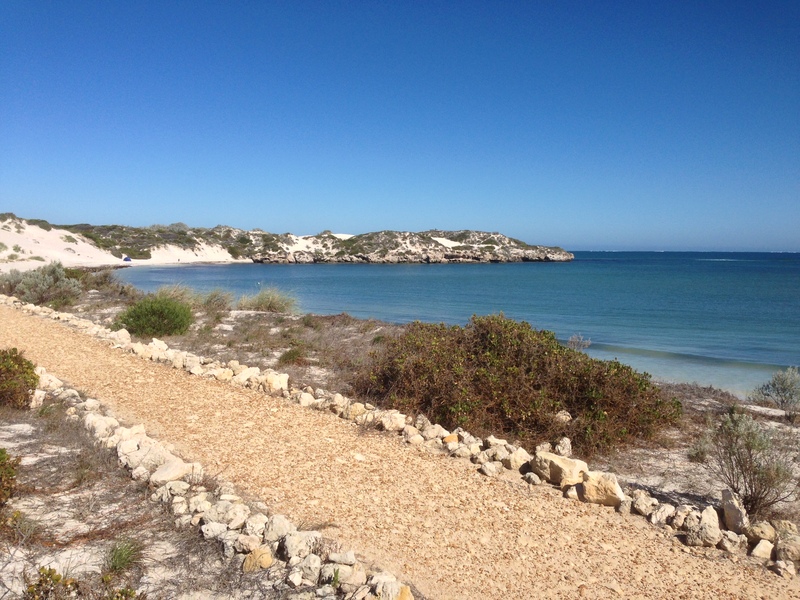 Sandy Cape is a brilliant camp spot north of Jurien Bay in WA. The basic offerings of a long drop loo satisfies the fisher crowd that pack into the pretty bay. We were staying here because I kept reading about swimming with sea lions at Jurien Bay and Green Head, and ever alert for opportunities to commune with sea-life decided this was an excellent gift for W.
The boat we were to board was called Hang Ten (something like that), prompting warm memories of childhood surf labels. A multi-purpose vessel catering to fishing, diving, and in the off hours, sea lions tours. She had earnt the paint job she appeared to have been stripped for. Pounding through the swell it didn’t seem optimal conditions for such a trip, but Hang Ten was solid as a rock and the ten young people of varying nationality that boarded with slabs of condensating stubbies were in high spirits. The french girl whose thong bikini afforded no comfort against the metal seating bounced from spot to spot. The rock climbing Irish lad swung from the roof on single fingers. And before we knew it we were at the sea-lion island. A relaxed colony onshore were about to have their peace broken. Smacking fins together, a crew member wandered up and down the shore encouraging the resting mammals into the water for the eager punters bobbing about in the water. 30 minutes on and the performing sea lions retired back on shore, save for one teenage male that the older males prevented making land. Six of us chased him about, in between looking back to the boat for any sea lion sightings that the crew member on the bow would point out with her roll-yer-own. Back on board the wiry Irish guy had succumbed to sea sickness and lay ashen in the corner. The thong was doing the rounds, up and down the stairs to the bridge, and beers were getting warm. Irish downed a warm one, and like a miracle was up and doing one handed chin-ups to the delight of the crowd. A lovely Irish girl shared the rest of her six pack, and tea and muffins headed off greying pallor. As the sun settled back at camp, it became apparent that the tree we were camped next to was the midnight pee spot for all the men that had gone before. The malodorous waft of the PeeTree gathered under the camper annex and took residence in my nostrils, departing only once we had achieved a distance of 5km. Camping. 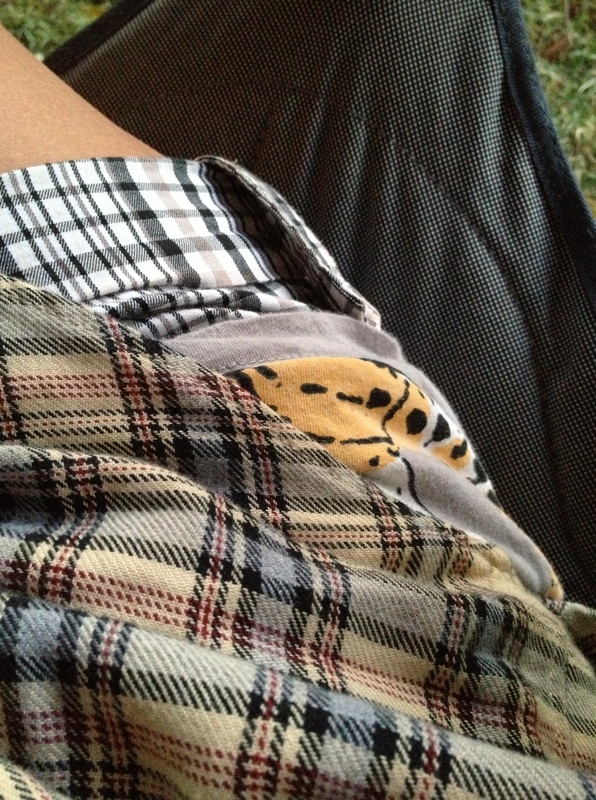 the only time plaid-on-cheetah-on-plaid is ok.
Wow, sounds fantastic, apart from that little tree. Happy Birthday Warren, you certainly know how to enjoy them. Thanks love! Waz says thanks too!